As summer temperatures rise, you may be planning to head to the water to cool off. But if you enjoy documenting your summer activities with photographs, this can prove challenging. High-tech cameras and water don’t traditionally mix. 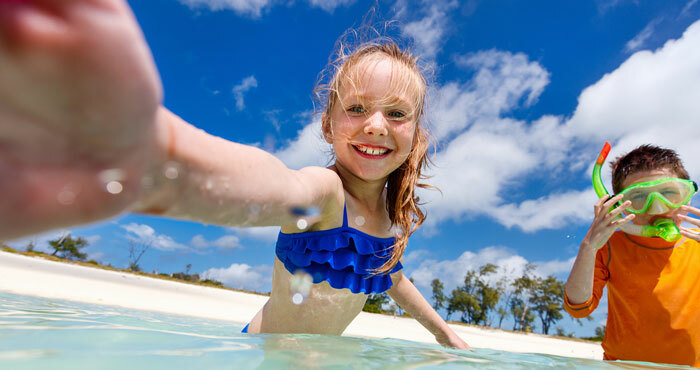 To capture images when you’re surrounded by ocean waves or leaping off a diving board, consider a waterproof camera. Many point-and-shoot models are designed with similarly rugged intentions in mind. Strong inner and outer chassis construction makes them able to withstand any summer beating you can dish out. Their rough-and-tough designs can survive a steep fall and shoot properly even after being lost in a bucket of sand during a castle-building competition. If you’re searching for a device that’ll stack up to your summer adventures, check the IP code (International Protection, or Ingress Protection rating) to see how truly water-safe the device is. The IP code is an international rating to standardize terms like “waterproof” and “dustproof.” It includes two numbers and an optional letter. The first number tells you if it’s dustproof, and the second number tells you if it’s waterproof. To keep out the finest sand particles, look for the highest rating of 6 in the first number. If you just want something splash-resistant, look for a second number of 4, 5 or 6. If you’re planning to be poolside, a rating of 7 will survive in 1 meter of water, and an 8 means the device is typically hermetically sealed and can survive being immersed beyond 1 meter. These four cameras will help you capture the hottest moments this summer. The latest iteration of the rugged camera loved by extreme sports enthusiasts, the Hero5 Black action camera is equipped with stunning 4K video and 12-megapixel photography. This camera was designed with simplicity in mind, with a one-click shutter button that turns on the camera and starts recording automatically. Users can shoot RAW photos to capture as much data in each image possible, ideal for advanced photo editing software. Capture the rockiest of images while riding an ocean wave with the advanced image stabilization feature. The camera is waterproof up to 33 feet. Snap photos hands-free using voice control. A GPS feature documents where your images were captured. Duo-stereo audio channels provide advanced audio processing, and an on-screen exposure control lets you fine-tune your settings even in the poorest lighting conditions. Additional features include time lapse photography, 30 frames per second burst mode, continuous shooting, night mode, looping video and Bluetooth and Wi-Fi connectivity. Speaking of connectivity, access all of your images and videos even when your Hero5 Black isn’t nearby with a GoPro Plus subscription, which automatically uploads your data to the cloud for easy viewing and sharing on the go ($4.99 per month). 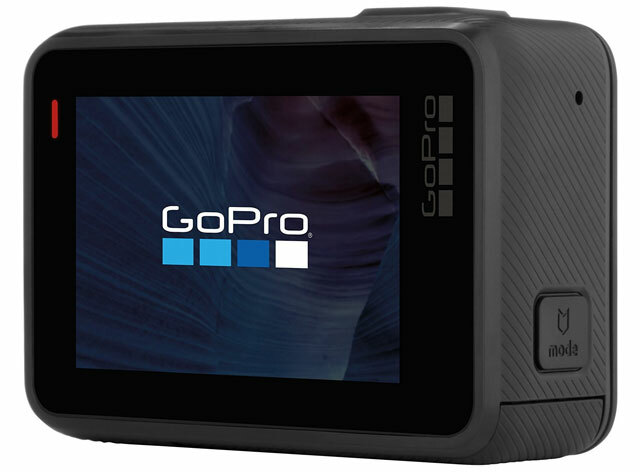 The GoPro Hero5 Black comes in black, of course. Lens: Choose between wide (14mm), medium (21mm) and narrow (28mm) field of view. Whether you’re exploring a mountain range, catching some sunrays on the beach or living out your marine biologist fantasies in coastal waters, the Nikon Coolpix W300 has you covered. This camera has a rugged body that can travel with you even in the most extreme circumstances. It’s dustproof and can withstand drops from up to 7.9 feet, submersions up to depths of 100 feet and extreme temperatures as low as 14 degrees Fahrenheit. Its rugged design doesn’t detract from its image quality. The W300 is equipped with a 5x optical zoom NIKKOR lens that takes 24 mm wide-angle shots just as well as it does 120 mm telephoto shots. It has an aperture range of f/2.8—f/4.9, a 10x optical zoom and 16 megapixels to help you achieve crystal-clear pictures. To ensure every shot is on point, on land or under the sea, the Coolpix W300 has a backside illuminated CMOS sensor and high-performance vibration reduction to reduce camera blur. Beyond photographs, the Coolpix W300 supports 4K UHD (3840 x 2160 at30/25p) video recording. Shoot with your social media accounts in mind: a time lapse feature condenses an hour of action into just 10 seconds of footage, and a Superlapse feature lets you speed up time. Not advanced enough? There’s also a built-in LED light, GPS, eCompass, altimeter, depth gauge as well as Bluetooth and Wi-Fi connectivity. 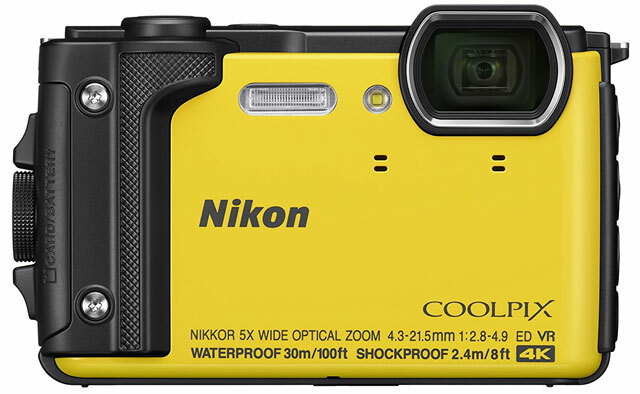 The Nikon Coolpix W300 is available in orange, black or yellow. This camera has “tough” inscribed on its body, and for good reason. The Tough TG-5 is not only waterproof up to 50 feet, it’s also crushproof up to 220 pound-force, the only model on our list with this kind of strength. It’s also dustproof, shockproof up to 7 feet, and freezeproof up to 14 degrees Fahrenheit. No matter how you spend your summer, the Tough TG-5 has you covered. There’s built-in Wi-Fi, GPS, a compass, a temperature sensor and a manometer for tracking depth and altitude. You won’t miss a shot when things get humid, because the lens is equipped with antifog protective glass to prevent moisture from seeping in. To capture your best moments, this 12-megapixel camera has a 4x optical zoom, high-speed F2.0 wide-angle lens, action track sensors, an aperture range of f/2.0—f/4.9 and the ability to shoot continuously up to 20 frames per second. Shoot in full RAW to maintain full photo processing control in your editing software. You won’t miss a moment with Pro Capture Mode, which captures not only the moment you snap a shot but the previous five frames as well, allowing you to select the best split-second shot. The Tough TG-5 is more than a point-and-shoot camera. Turn the Mode Dial to microscope mode for macro shooting, so you can catch every detail of a seashell as close as 1 centimeter away — up to 44x zoom. Looking for a different view? Attach optional lenses such as a fisheye converter lens or accessories such as a waterproof flash diffuser to enhance your shots. In video mode, this camera can shoot in HD 4K video (1080p or 720p). A time lapse feature condenses longer shots into shorter clips, and you can shoot in 120fps high-speed video for slow-motion playback. With the specialized image sensor and dual quad core TruePic VIII processor, every shot remains crystal clear no matter what the conditions are. 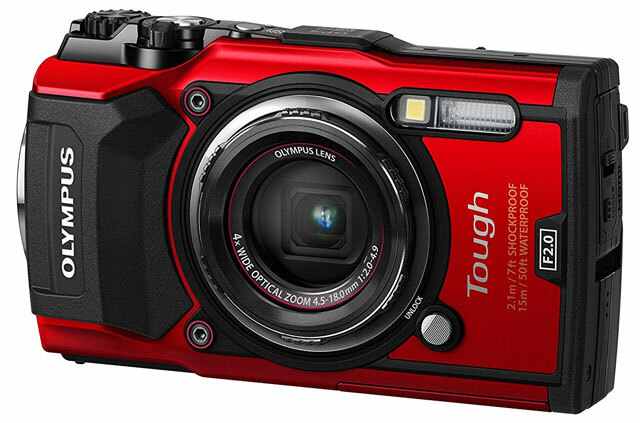 The Olympus Tough TG-5 is available in black or red. This camera masks its rugged features in a slim design. At just 0.77 inches thick, it’s the thinnest in this lineup. It is freezeproof up to 14 degrees Fahrenheit, shockproof up to 4.9 feet and waterproof up to 26 feet. The Lumix DMC-TS30 takes great photos day or night, thanks to its sharp Lumix DC Vario lens, which houses 16.1 megapixels, 4x optical zoom, an aperture range of f/3.9—f/5.7, and a 25 mm wide-angle and 100 mm telephoto lens. A Mega Optical Image Stabilizer compensates for motion blur. Capture images on the move using the MP4 HD video (1280 x 720 at 30/25p), or experiment with scenery shots with panorama mode.The Lumix DMC-TS30 even thought of your grade-school science project when it designed the Advanced Underwater Mode. Since red is the first wavelength of light absorbed by water, AUM brings underwater images to life by compensating for the red tones often lost in underwater shooting, especially in reef life. There are also Beach, Snorkeling, Sports and Snow action modes to take your shooting up a notch. Additional features include time lapse photography, an LED light and 220MB of additional storage for when your memory card is full. 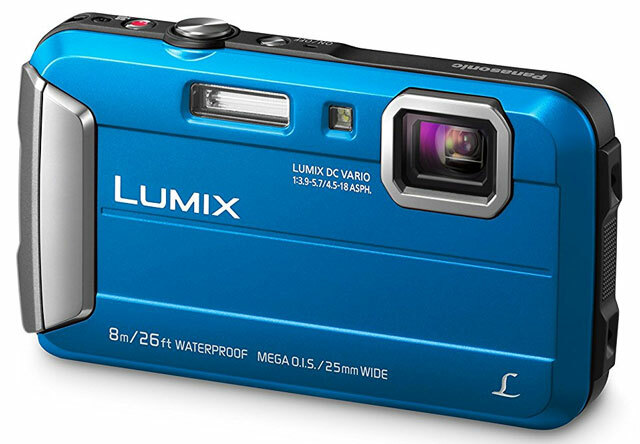 The Panasonic Lumix DMC-TS30 comes in red, blue or black. If you already have a camera you love, protect it with a Dicapac waterproof case. Each keeps your camera safe from damage while still allowing you to take great pictures up to 16 feet underwater. 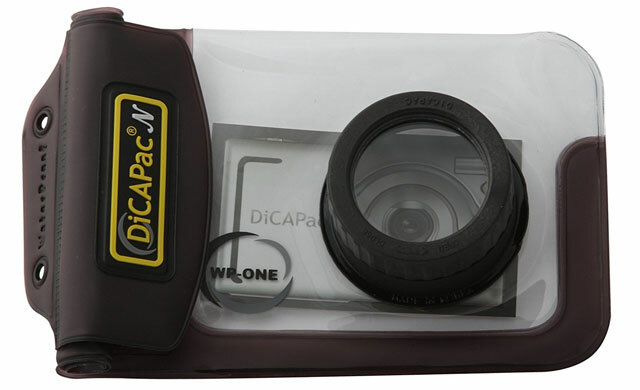 The Dicapac WP-ONE protects point and shoot cameras for just $13.99, the WP-S3 ($57.73) keeps hybrid cameras safe and the WP-S10 ($81.47) protects compact digital cameras with larger lens attachments. Want even more camera protection? Check out the Chums Waterproof Camera Float. It’s a simple foam-filled wrist lanyard that attaches directly to your camera (up to 7 ounces), allowing it to float on top of the water rather than sink to the bottom of a pool or the ocean. The bright yellow color makes it easy to see in murky water. Best of all, a float won’t break the bank – you can pick one up on Amazon for just $12.13.